When Mozilla announced that it would add so-called Directory Tiles to Firefox, it was heavily criticized for it even though most users of the browser won't come into contact with the feature often if at all. While you can criticize the choice of name, as sponsored tiles would make more sense here, it is not a feature that plasters ads all over the Firefox browser in an effort to make money. 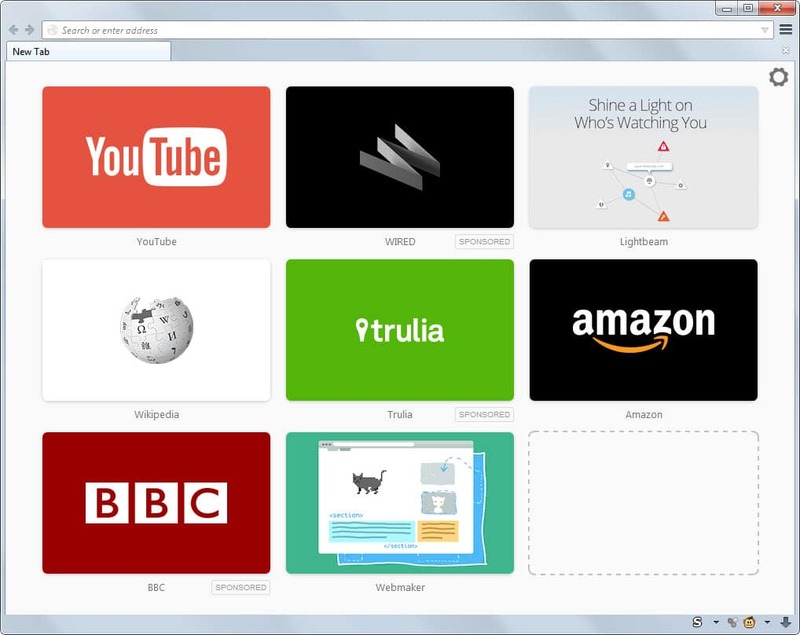 Sponsored Tiles are displayed on the New Tab Page of the browser, but only on new installs or if the user has cleared the browsing history. If you never do that or sync data to all new installations using Firefox Sync, then you will never get into contact with Sponsored Tiles. As you can see, three of the tiles displayed on the page are marked as sponsored while another three lead to popular websites and two to Mozilla services. It is interesting to note that Amazon is not listed as a sponsored tile on the page even though Mozilla's referral link is clearly visible in the url it points to. While it may not be sponsored by Amazon, it is clearly a commercial link and should be marked as such. The three sponsored tiles at the time of writing lead to the online magazine Wired, the real estate website Trulia, and the BBC. The remaining three non-sponsored non-Mozilla tiles link to YouTube, Amazon and Wikipedia. Last but not least, the two Mozilla tiles link to the Lightbeam extension and Mozilla Webmaker. Note: Sponsored tiles may differ depending on the version of Firefox that is used, date, and maybe other factors such as location. A click on the sponsored tag displays a short explanation on it: This tile is being shown to you on behalf of a Mozilla partner. You can remove it at any time by clicking the x button. The learn more link leads to this Knowledge Base article on Mozilla Support which is a preliminary page offering little information at the time of writing. Tiles can be removed with a click on the x button that appears when you hover over them. They will be removed gradually from the new tab page automatically once you start to browse the web, as sites you visit replace them. Once you clear the browsing history, using Ctrl-Shift-Del for instance, or install Firefox anew, they are displayed again. The only protection right now against this is to pin nine tabs to the browser's new tab page as these pinned tabs won't be removed from the browser when you clear the history. Other options include installing a third-party extension that takes over the New Tab Page, e.g. New Tab King, or by turning off the display of tiles on the browser's new tab page completely. I applaud Mozilla for trying to find ways to find revenue streams that are independent from Google. In my opinion though, doing it this way may not be optimal. The organization could ask the community for help instead which may bring in more revenue than the directory tile feature will. As long as this is transparent, say posting affiliate links to popular shops explaining that Mozilla will earn money when users use them, or asking for donations by integrating the donation form in Firefox one-time, it may work a lot better than this. Sponsored tiles on Firefox's new tab page have appeared for the first time in Firefox Nightly 34 versions. Find out how they look and how to disable them. I don’t think that “sponsored tiles” makes more sense with only three sponsored tiles. Or we need a second name for the other predefined tiles. ;-) Earning money is an important aspect, but there is a second: Provide a more useful about:newtab page. New users start Firefox and see a page with eight grey tiles on about:newtab, that’s a poor experience for new users. Suggestions are better than useless grey tiles. So while there are other options to earn money, the directory tiles add additional value. I’d call the rest simply tiles if that makes sense. I agree that it can improve the user experience, but that depends largely on which tiles are displayed here. Thanks for the breakdown. Question: doesn’t Safari put out sponsored tiles in a similar format? I know it’s a false comparison since Firefox is supposed to be an open, community-based browser where we really expect Apple to sell ad space. Sounds sort of like Opera Speed Dial; I don’t even know quite what it is or what to do with it (duh! ), but it is so perfectly me for browsing. And I actually have a neat choice for themes. Opera with Turbo and the ability to use Chrome add-ins–it’s a winner for me. You know, maybe because they don’t use an “in your face” approach that makes them more likeable–opinion, naturually.